As social and political resistance movements make daily headlines, is there room for a brand in that conversation? A few companies have tried to make social awareness a focal point of ads or messaging, but have come off doing more damage than good. Today’s consumers actually prize social responsibility — but not as a selling point. Sadly, some companies haven’t learned that lesson. 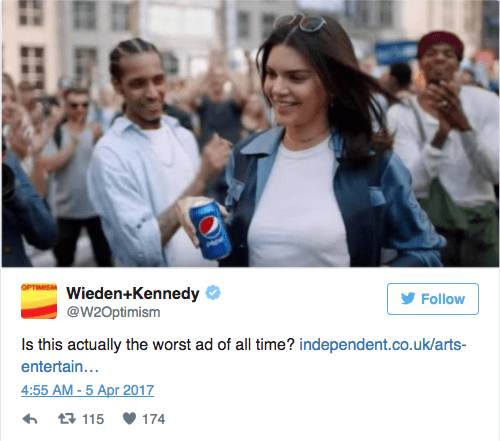 Pepsi quickly pulled its ad, but not before a wave of outrage from social media, and the ensuing mocking memes. The commercial was incredibly tone-deaf, making light of tense conflicts with the police. Lyft’s Zimmer saw his comments laughed off, as consumers pointed out that they don’t treat drivers much better than Uber. Customers are able to see right through these types of efforts. By trying to look socially responsible, these companies have actually hurt themselves and barged into a conversation not meant for them. Consumers don’t want social responsibility to be part of an ad campaign. They want to buy from companies that actively practice it — and not just in front of a camera. Instead of showcasing your “wokeness” in an ad or staging a fake resistance rally just for product placement, brands can actually gain superfans by enacting more responsible practices. A study by Nielsen shows that consumers will respond to true, authentic awareness with their wallets. In that survey, 66 percent of those polled said they’d be willing to spend more on products that come from companies committed to a positive social and environmental impact. One of the key tenets of companies such as Salesforce, Patagonia and Adobe is charitable efforts. They encourage their employees to donate to charity and spend hours during volunteer work, often giving them a reward for doing so. This is a common and very effective way to practice corporate social responsibility without contacting an ad agency. TOMS Shoes has become a popular brand, especially among Millennials, for their One for One program. For each pair of shoes purchased, TOMS donates a pair to someone in need of footwear. Brands big and small can find a way to tie sales to charitable giving, positioning themselves as the socially conscious choice through action, not advertising. TOMS’ philanthropic business model has become so industry-leading that other brands such as Warby Parker have emulated their One for One program. The most basic way to become a socially responsible brand is to bring environmentally conscious practices in house. Whether it’s doing what you can to become a paperless office or ensuring that employees all through the supply chain are paid and treated fairly, find out how you can improve within your walls by looking into programs such as becoming a certified B Corporation. As you learn more about your customer base, you’ll find that they have causes near and dear to their hearts. For local brands, it could be cleaning up a local lake. For bigger brands (such as Target), it’s helping schools. When you use your name, money and workforce to be a champion of this cause, it will only strengthen the bond between your company and your customers. It won’t be cheap or easy, but truly taking the steps toward corporate social responsibility will be worth it. Today’s consumers prefer to spend their money with companies dedicated to making the world (or local area) a better place. They’re savvy enough to see through a glitzy ad campaign, knowing which companies truly walk the walk.